The core topic areas we cover include innovation, sustainability and environmental issues, collective passenger transport, tourism and mobility, road safety and security, new mobility concepts, and access to the market, fair competition, and evolution of Europe’s transport network. IRU’s regional office in Brussels also wholeheartedly supports the latest transport innovations in Europe, both for commercial vehicles and in the field of collective passenger transport. We work hard to share our long-term sustainable transport vision, which include among others, our Smart Move campaign for buses and coaches, UpTop for taxis and the Commercial Vehicle of the Future operating on intelligent transport infrastructures. IRU’s presence in the EU extends across the European Union, as well as to Norway, Lichtenstein and Switzerland. Many of these countries lead the way in terms of best practice for mobility of people and goods. Over the decades, IRU has advised and collaborated with EU Institutions, governments, transport ministries, road- and collective passenger-transport operators across this whole region, working in a multi-stakeholder dialogue to address the region’s common concerns. When it comes to sustainable mobility, Europe leads the way. Similarly, Europe is a global leader in road safety, and can claim to have the safest roads and vehicles in the world. As such, innovations made here are disseminated globally, among other IRU regions. The same goes for transport innovation – the EU spearheads new technologies for transport, such as more efficient and less emitting trucks, buses and coaches making use of electrification or alternative fuels as well as new truck design, such as more aerodynamic vehicles or eco-combis, which allow longer load vehicles that ‘do more with less’. New logistics concepts are tested including the use of electronic documents e.g. eCMR alongside with deployment of ITS and connected driving where vehicles can ‘talk and listen’ to each other and the road and be warned of e.g. traffic incidents, obtain pre-emption at intersections, or bad road conditions. Mobility of people is key for many of our EU passenger transport members, notably bus, coach and taxi operators, which IRU considers all to be part of the collective passenger transport network. As one of the world’s tourist destination hot spots, bus and coach tourism is big business in Europe, which is why IRU works closely with e.g. NET, a network of tourism-related trade associations in Europe. 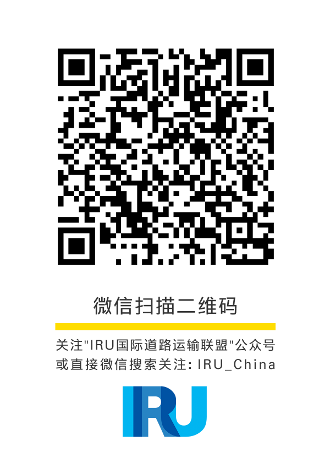 IRU also addresses social affairs in this region, relating to the 'human element' of drivers and transport operators. One of the greatest strengths of commercial road transport is its capacity to deliver goods ‘just in time’ and to provide mobility to citizens skillfully, efficiently and safely. A lack of qualified drivers can hinder this performance. For this reason, social issues that focus on the human element, from working time to training, are of crucial importance for the road transport sector, and IRU works to resolve these by lobbying for working time limits and driving and rest time rules, driver training requirements, driver licensing, rules for the posting of foreign workers, social security provisions and many other legal obligations. Read about the IRU Resolution on Driver Shortages and Better Strategies for Recruitment and Retention. A digital tachograph is a technical device that tracks drivers' work times and ensures fair competition, and IRU is working to ensure this tool is a better support tool for drivers. Read how IRU is helping Driving and Rest Time Rules to become better understood by defining daily rests, sanctions and tachograph records. Particularly in the domain of collective passenger transport, IRU has expanded its synergies globally, creating strong relationships around the world between taxi, bus, and coach operators. IRU in Brussels hosts the global Passenger Transport Council, which, although based in the EU, is very much a global network. Other synergies are found following European legislation, as Euro norms are often adopted elsewhere in the world, notably for best-practice environmental standards. This IRU EU office works closely with IRU in New York on UN matters relating to sustainable transport, and with IRU in Moscow e.g. through the ‘Smart Move’ High Level Group established there. This Group works towards clean, safe and affordable transport mobility. Finally, the EU office also liaises closely with our IRU counterparts in Turkey and Beijing to keep abreast of new developments in both passenger and freight transport. Sustainable development and environmental issues are at the heart of the European agenda, and IRU helps translate these values to its members in the region. We draw on our three pillars - economic, environmental and social sustainability - to help frame key issues within the road transport industry. This means helping our members consider topics such as working and driving and rest times, driving licenses, secure parking areas etc. Elsewhere, we ensure members take the environment into account as they go about their daily business, and we do this by encouraging them to adhere to IRU-wide initiatives such as ’30 by 30’.